Line from the film: "Has life without fire become unbearable for them?" Lessons of Darkness is a documentary, but it’s also a Werner Herzog documentary, meaning that its part fiction and part reality. The setting is Kuwait, just after the first Gulf War. The retreating Iraqi forces, acting under orders, employed a scorched earth policy, setting fire to hundreds of oil wells on their way out of the country. Herzog was on-hand to capture images of the burning wells, yet presents them, along with other scenes of destruction, as if it were a science fiction film. “A planet in our solar system”, says Herzog, who also acted as narrator, “wide mountain ranges, clouds, land covered in mist”. By spinning it as a sci-fi tale, Herzog strips away the political and social context of each sequence, allowing the imagery to speak for itself. More than this, though, he sets the stage for the devastation to come, which, at times, transforms the landscape into what looks like an alien world. Separated into thirteen sections, Lessons of Darkness opens with a flyover of Kuwait City, followed closely by debris spread over a wide area of desert (In keeping with the fiction that he established at the outset, Herzog links the two scenes together, presenting them as “before” and “after” shots of the same location, insinuating that, due to the war, the great city has vanished entirely). We do eventually meet a pair of Kuwaiti women, both of whom (if the narration is to be believed) were victims of atrocities, and take a tour of areas so saturated with oil that, from the air, it looks like we’re passing over a lake or river. Then, starting with section 8 (titled “A Pilgrimage”), Herzog’s commentary is reduced to next to nothing. It’s at this point Lessons of Darkness takes a decidedly surreal turn, focusing on firefighters as they attempt to extinguish the out-of-control blazes and cap the flowing oil. Set to the music of Wagner, one sequence in particular reveals the total chaos of the situation: fire shooting from the ground; oil falling like rain; and plants that, once green, are now completely black (one shot, showing a section of land that is grey and dead, seems to support Herzog’s assertion that this is not earth, but the surface of another world). 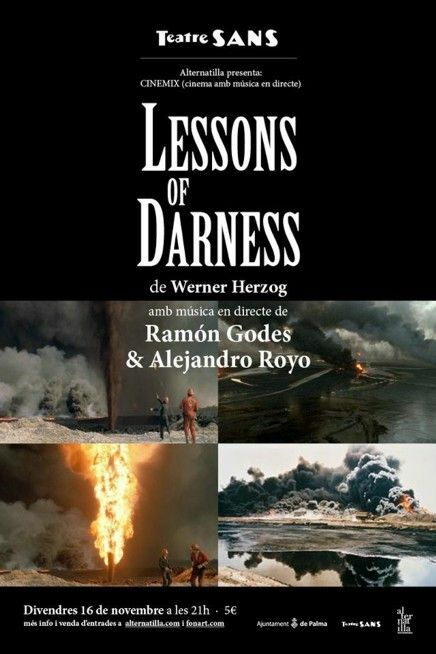 Yes, Lessons of Darkness is a Werner Herzog documentary, and is not entirely factual, yet the truths conveyed by the images themselves are overwhelming, and more "real" than anything you’d ever see on the nightly news. Wonderful visuals indeed. But was it fully shot by Herzog's team, or was it mostly taken from the 'prerecorded video of CNN' as mentioned in the credit scroll at the end ?